I love this mat and it matches what I have in my kitchen (that isn't made anymore). The only reason I gave 4 instead of 5 stars is it is thinner than I had expected and doesn't stay put....it moves easily. Otherwise it is a great mat! 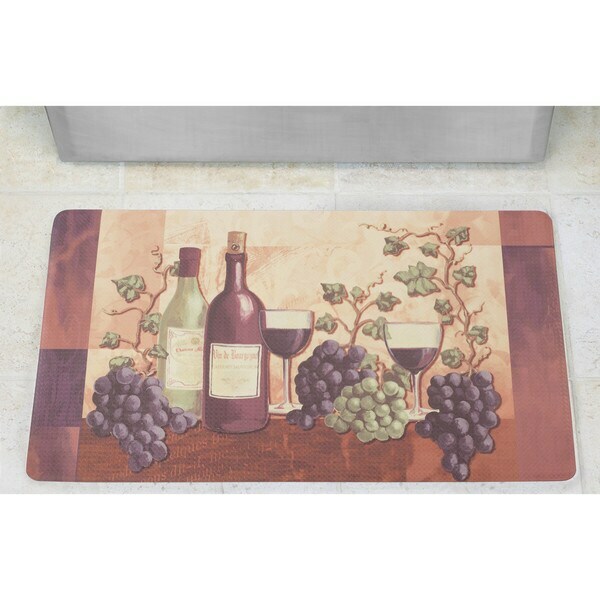 Chef Gear Cabernet Anti-Fatigue Gelness Kitchen Mat - 1'5" x 2'5"
Whimsical designs combined with the exceptional comfort of BounceComfort Gelness technology will provide continuous relief while you work. Anti-fatigue mats promote better posture, circulation and muscle conditioning. Includes (1) 24" x 36" kitchen mat. Each mat features a non-slip surface and non-skid bottom for added safety and stability. Beveled, anti-trip edges finish off each mat with a sleek look. 100% PVC. Imported. The mat is very disappointing. It says 2' X 5 foot and is only 3' long. It is also much thinner than the other mats I have and will probably not last nearly as long as they have. Fantastic from start to finish. We are very pleased with every step of transaction. Purchase price, good to excellent; delivery, fantastic, quality way above average. Very pleased, highly recommend. "Is this mat 2 feet x 5 feet as stated in the heading or 2 feet x 3 feet stated in the description?" I ordered this because it says it is 5 foot long. It is 2 X 3. Very disappointed. It is also much thinner than my other anti fatigue mats.